With a new Dragon Age out on the shelves, it’s finally time for legendary RPG dev BioWare to pull back the curtain on its next Mass Effect game. Most certainly not called Mass Effect 4, the studio stresses, it’ll nonetheless exist within the same universe as the Shepard trilogy, albeit with all-new characters. 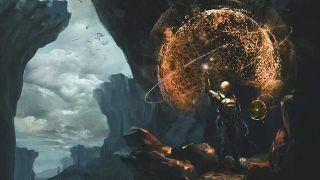 “Our goal is not to build Mass Effect 4,” senior development director Chris Wynn told fans via a Twitch broadcast, adding, “it’s beyond that.” The full extent of what it means to go, “beyond,” those first three games isn’t yet clear, but for one thing there’s a pronounced emphasis on exploration from the team. Completely new species are promised to populate the galaxies, complete with their own worlds and architectural styles. Take a look to the bottom-left: you’ll see some environmental concept art featuring the unfamiliar flat, fungus-like dwellings of one such race. There are familiar images in the other concept renders here, too. The M35 Mako ground vehicle returns from the original trilogy, complete with an entirely revamped handling model – expect to see plenty of it as the vehicle’s set to be one of the primary conduits of exploration. It’s clear there’s still plenty left to lock down, but BioWare’s set on centring the experience on a protagonist in the process of becoming a hero, unlike established N7 medal-magnet Shepard. There’ll be a familiar party member dynamic too, and relationships to manage within that party. As for the eventual name reveal BioWare leaves us little to go on, but, we’re going with Mass Effect: Ultimate Origin Chronicles Unleashed – Extreme N7 Edition.